A huge thank you to the 125 friends who contributed to our matching gift challenge campaign – we made it! Actually, we MORE than made it!! 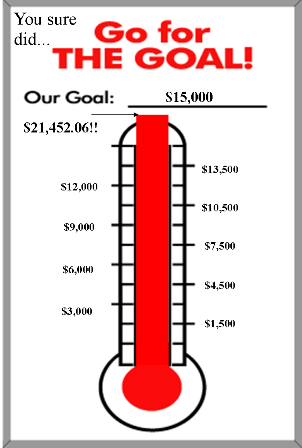 You gave gifts totaling more than $21,452.06! Our matching grant donor called us to say he’s cutting the check for the full $15,000. He’s so happy for us. And I can’t thank you enough for responding to this urgent need – with your donations, your notes and your prayers. The news of late has been extremely challenging. We face a fierce battle to defend innocent lives against a mighty, well-funded culture of death. Yet we know that we have the strength, love and mercy of God, the Father of Life, on our side, and we have no fear. We also have each other! Contrary to the feeling you might get from the news, we are not invisible – there are far more of us who are FOR life than against it! Let’s spread the word, shall we? Let’s band together, work together, and most of all, pray together! The CPLC provides numerous avenues for pro-lifers to do just that. Please stay connected with us, communicate with us, and watch our events calendar for opportunities to gather with us. Your continuing support helps us save lives every day. Thank you again, from the depths of my heart, for your vital support.